In the spirit of Christmas and as the year come to a close, we would like to thank you again for your past generosity to Foundation for Women’s Advancement. We would also like to share with you the great work of our partners in 2018. They continue enabling countless women and girls to achieve what they never thought they could reach. More importantly, working together, they discover their value and self-worth and that of those around them. Because of our partners’ work, these women and their families know that their advancement does not lie in them experiencing their capacity to achieve more than what they had ever dreamed. Rather, it lies in the realization that human beings are all inter-connected and caring for each other is both a natural reaction and a need. If given the opportunity, they can produce an extraordinary return from an investment in their education and training and therefore lift up their families and communities. This success would have not been possible without your commitment and contributions! • From Kenya, we learned that the last of the entrepreneurship training series took place few weeks ago. Of special interest was the session on Digital Marketing, where participants were taught to market their products using social media platforms. 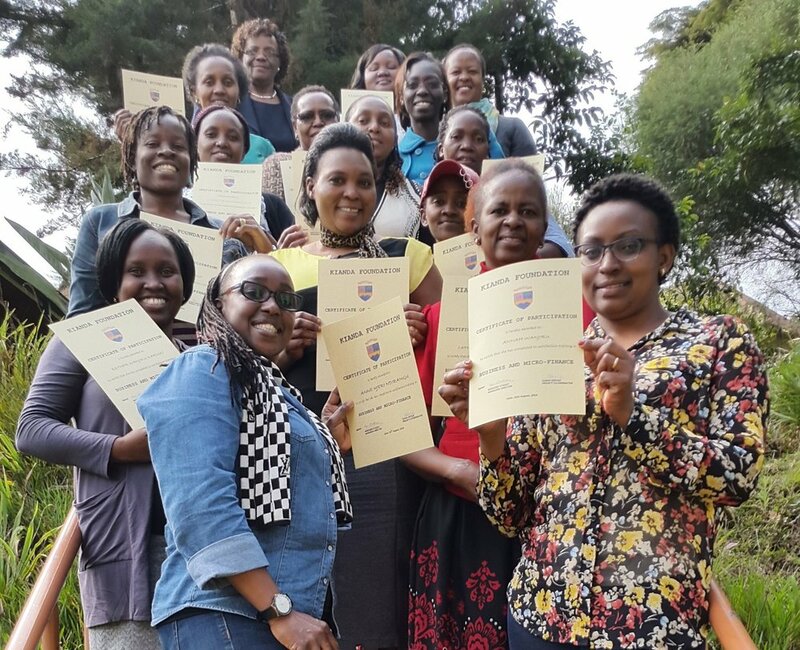 Mildred Mafura and Jacqueline Mwaura, who previously benefited from the training you helped sponsored, were invited to give their experience about how new horizons were opened up by the training and the help received, enabling them to set up and run their successful businesses. • Sorowell, continues preparing young women in Cameroon to enter the growing hospitality and tourism industry in the country. These young women, who come from poor and difficult family environments, would have dropped out of primary school. Instead, they are completing their high school and professional studies. Severine and other recent graduates are working in Yaoundé’s leading hotels. They are now in a position to help support their families, to educate the little sisters and brothers, and to pay for medicine. Furthermore, Sorawell has become a reference point for the Ministry of Employment and Vocational Training, which seeks to raise the quality of vocational education in Cameroon and support the Government's effort for development of Tourism, in partnership with the Ministry of Tourism. • In the Philippines, Kabataan continues to work with young women, ages 12 to 18. These students come from poor families who live in slums of Muntinlupa City, Metro Manila. Their families have no stable source of income and if it were not for Kabattan, only 10% of them would complete high school. Crysjoy and Eloisa, both alumnae of Kabataan, are now enrolled in the two-year Dual Training Program in the Food & Beverage Services course of Punlaan School and are both presidents of their respective classes. When asked what inspires her to overcome the challenges she faces in life, Crysjoy talked about the “STRONG virtues” (Steadfast, Trustworthy, Respectful, Open-minded, Noble, Gutsy) that she learned in Kabataan. Their outreach continues to grow. In addition to the 280 girls they directly work with, this year they offered family support courses to 240 mothers and teacher’s training to 160 teachers from schools in the area. • Moving to central Europe, Slenis Cultural Center in Lithuania continues to engage young women to strengthen social and civic institutions through different activities. The activities included Human Service Leadership through which several voluntary activities were initiated by young professional women. Also seminars were organized on spirit of cooperation as well as solidarity in the XXI century for high school and college age students. • This past September, I had the opportunity to meet with Marcela Zimerman, Director of Protege tu Corazón in Buenos Aires, Argentina. Their work has expanded from reaching only teachers and students, to training parents so to help their children, more effectively, be persons of character, who recognize their value and are able to make responsible choices especially related to their sexuality and other issues, such as drugs and alcohol. This year they have started in several new provinces and expanded their reach in Buenos Aires. These are some of the real differences our partners in the U.S., Africa, Asia, Central America, and Central Europe are making in real women and their families. Going forward with your help, we can continue to build together and make a real difference in the lives of these women and their families. On behalf of everyone at the Foundation for Women’s Advancement and of the 276,392 persons that have been reached in the past eight years, we wish you and your family a peace-filled and restful Christmas season and a Happy New Year.